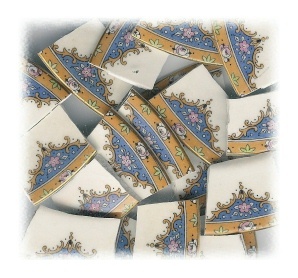 20 tiles from Carrollton china plates. Pink flower, blue background, gold scrolling, gold rim on white china. All rim tiles. No discoloration, slight crazing on some tiles, lay flat. Tiles average approximately 1.25" wide.